Let us give you a real world example, let us say we have an option to get a Gridseed G-Blade currently being sold for $615 USD (a very attractive price actually) that offers 5.2 MHS hashrate at 140W power usage. Then we also have an option for a 13 MHS GAW Black Widow, based on Zeus ASIC chips, that uses 520W of power and costs $1,799.95 USD. And a third option for an 24-28 MHS A2Mini Miner, based around Innosilicon A2 ASIC chips, using only about 250W of power. If we are to reach the same hashrate of the Black Widow we would need 3x G-Blades (15 MHS) and we are going to have 420W of power usage for a price of $1845 USD. So for just a few dollars more we are going to get 3x Gridseed G-Blade miners that will provide 2 MHS more of hashrate, consume less power and we are not going to have to wait for them to be ready for shipping. Next up 5x G-Blades totaling around 26 MHS hashrate with 700W of power usage will cost us about $3075 USD, while the 24-28 MHS A2Mini with 250W of power usage will cost us $3900 USD. There is a higher power usage for pretty much the same hashrate, but we are going to be saving over $800 USD if we go for the already available for a while Gridseed G-Blades. What is wrong with the above example, is the Gridseed G-Blade just too cheap or the other Scrypt ASIC miners are just too expensive, so that we can get similar or even better results with the Gridseed hardware? 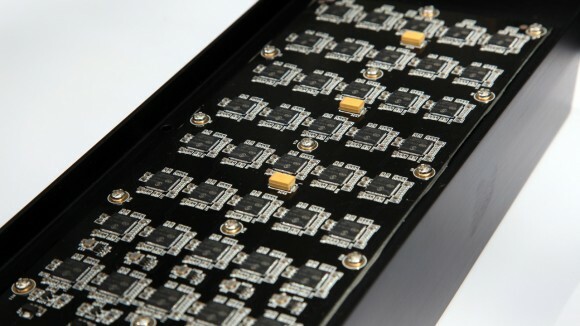 The price of about $615 USD is just about right for what the G-Blade currently offers, so it seems that the other ASIC manufacturers are trying to maximize their profits, but by doing that they may be driving away customers. If the ASIC business is working as it should be, when you do the math and are going for a more powerful ASIC hardware in terms of hashrate, it should be more attractive price wise and not the opposite, so if you have the money you would consider to go for the bigger and more powerful systems. Apparently this is not happening at the moment and as a result more and more potential customers are deciding against investing in expensive Scrypt ASIC hardware. What companies making Scrypt ASIC hardware should do is not to keep trying to maximize their profit while they can, as apparently they cannot do that anymore, but instead have to try to provide products at prices that will be attractive for the mass of people that are mining crypto currencies. The 300 MHS KnC Titan may sound great, but not many typical small miners are able to pay $10K USD for, we actually need more smaller and affordable Scrypt ASIC miners, so that more and more people will use them in order not to centralize the hashing power in just a few big mining farms. We need to have a lot of people mining and using LTC and other Scrypt crypto currencies if we want to have them survive and develop further, otherwise Litecoin and Scrypt can just die and be replaced by new GPU mineable crypto currencies such as DarkCoin for example. What we are already seeing is that a lot of miners using GPUs are no longer mining Scrypt crypto currencies, and are moving to other alternatives. X11 and more specifically DarkCoin (DRK) has recently surpassed the price at which Litecoin is being traded at. This, along with the fact that there are almost no new Scrypt crypto currencies being launched anymore, is a serious signal that the mass of miners is already not so interested in Scrypt crypto currencies. The reason for that are of course the Scrypt ASICs and if the business model of the companies making these does not change in the right direction, then some companies might be out of business before they even have products ready for shipping. If you believe in the future of Litecoin and other Scrypt crypto currencies, what you can currently do is to buy the coin on an exchange and wait for its rate to get higher in the future instead of buying a Scrypt ASIC and hoping that you would be able to mine more than what you have paid for the hardware in a reasonable amount of time. With the current prices for most of the Scrypt ASIC hardware, investing the same amount of cash directly for buying the coin could be more profitable than to spend your money for ASIC miners. After all what makes a crypto currency is the community behind it, the larger and more active in mining and using the crypto the community is, the better it is for the coin on the long run. And with all of the currently released and upcoming expensive Scrypt ASIC miners, things may start to get more and more centralized and the community to start getting smaller and smaller, and that is precisely what most of the crypto currencies are trying to avoid. So we do not need only $10K ultra powerful Scrypt ASIC miners that will go to just a handful of people and will be used in big mining farms – really making a lot of money mining with them. We need more affordable solutions that still offer a decent return of investment in reasonable time, so that more and more people could continue using Litecoin and other Scrypt crypto currencies. Because even if only a few people mine most of the Litecoins, there should still be somebody interested in buying them in order for the whole thing to be worth it, but what happens if there is nobody interested in buying? And a direct comparison with Bitcoin and when the first SHA-256 ASICs started appearing is not not a good example, because now there are way more people mining and way more alternatives available, and while Bitcoin is already here to stay we cannot say the same thing for Litecoin and the many other Scrypt currencies. There are already a lot of other non-Scrypt based alternatives available, and people are already turning to them, so something has to be done by the Scrypt ASIC manufacturers in order for them to have business in the future. Making a big profit quickly by selling expensive hardware and not investing back to further develop the crypto community is clearly not the way that things should be happening, or you are not going to be able to do it for long.